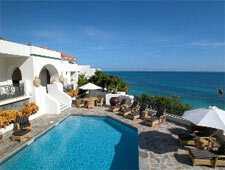 Any chance we can get to travel to St. Martin to meet with our preferred property manager we take advantage of. It provides us with a great opportunity to increase our knowledge of this beautiful island, and learn about the ongoing changes and villa improvements. Living in the Northeast, you would think that Caribbean would be very hot in July; however, the gentle trade winds keep the temperature at a pleasant 85 degrees – making this is a fantastic place to visit in the summer. After having a rather cold, rainy, and dismal June, we were both excited to venture to a destination that would greet us with consistent sunshine and warm, crystal clear water. The purpose of this adventure was to catch up on all the recent changes going on around the island. Our itinerary included tours of some recently renovated villas, several new villas added to our inventory, and others currently under construction. We also wanted to revisit La Samanna Hotel, which had just completed a $10 million renovation. We flew USAir from Providence to St Martin with a very easy and convenient connection in Charlotte. All flights were on time and we found Providence to be much more convenient than Boston's Logan Airport. We arrived at the St Martin airport and could not help but notice all the construction that was going on with the new airport terminal getting ready to open right across the street. Over the years, we both had our shares of adventures in the old airport, so the new one will certainly be welcomed with open arms. It will make the entire entry and exit experience easier. St. Martin has two very distinct personalities given that one side of the island is Dutch and the other French. On this particular trip our entire focus was to experience what we have all grown to know as a "Destination within a Destination"...the French Side. The villas here sit on an average of 2.5 acres of land with incredible views and privacy. The U-Shaped floor plans make it easy for families and couples to enjoy because the kitchen and living rooms/family areas are in the middle of the villa facing the views, and the bedrooms are on the "wings" of the villa. The swimming pool sits in the middle of this "U". Many villas have a short covered terrace that projects out into the pool, providing a serene place to relax. Often you'll find that poorly designed villas have bedrooms of unequal size. This could be a source of friction when two familes are sharing a villa and one ends up in a significantly larger room. Here in French St Martin, almost all of the bedrooms are the same size so everyone enjoys the same comfortable experience. What also makes the French side so wonderful is its convenience to everything. We were picked up at the airport by the property manager, and were at our villa within 10 minutes. One of the other exciting new features was that our rental car was sitting in the driveway of our villa, and we did not have to find the rental car company, wait in line, sign all the paper work, get a map, and figure out how to get to the villa. Our property manager had done everything in preparation to make our trip as smooth as possible. Each and every time we have taken the journey to St. Martin, we wonder: What's new in the Baie Rouge Beach area? This has become one of the Caribbean's most exclusive villa enclaves and we were thrilled with the host of "New and Improved" villas there. Villa L'Oasis, our perennial favorite, lies at the end of Baie Rouge Beach. The owner had recently added a new spa treatment facility just off the gym. This makes this villa one you won't want to leave. It has incredible views from all the rooms overlooking the beach, two swimming pools, it's meticulously furnished, and has all kinds of fantastic amenities. And talk about privacy! 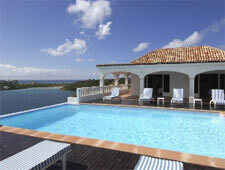 On the other end of the "bookshelf" at Baie Rouge is a brand new villa called Villa Le Reve. This villa has an incredible entrance of stairs with water flowing down the middle, a huge structure with high ceilings and sense of space, and it overlooks the beach. The pool stretches almost the full length of the property. What a place for a party or gathering. A tennis court is right out front and has lighting to allow you to play at night when the temperatures cool down. The staff here has taken care of your every possible need and you'll enjoy the latest in electronic devices and entertainment. There are half a dozen stellar villas spread out between them along the beach, giving our clients a full menu of choices. The entire setting is simply fabulous -- easy to get to, right on the beach, privacy, plenty of space, and added security to give everyone peace of mind day or night.